Thanks for reply, three-prong plate is just ordered from the German supplier. I had a used RM alm flywheel in my hands this past summer. It had no markings on it and looked, from what I can tell, exactly like the oem alm one in the photo provided by Scud. It had no damage, but appeared to have tiny casting flaws that 'could' develop into something. The flaws were on the outer rim area, not the center as most fractures. This is not to say that they may have been sourced differently, but only that the part number is the same. That survived word is good.. it's really nothing to take for granted when a mechanical failure occurs on a motor bike. Trust me on this..
Glad you're safe Hayo. Sorry for the bike failure. Welcome to the forum. Lots of pertinent info on here. Was the motor bell housing damaged? No fortunately not, garage people call me the „Lucky Guy“ now . Just see this now. Scura, 401 A bit late to count, I had an exploding flywheel bike. 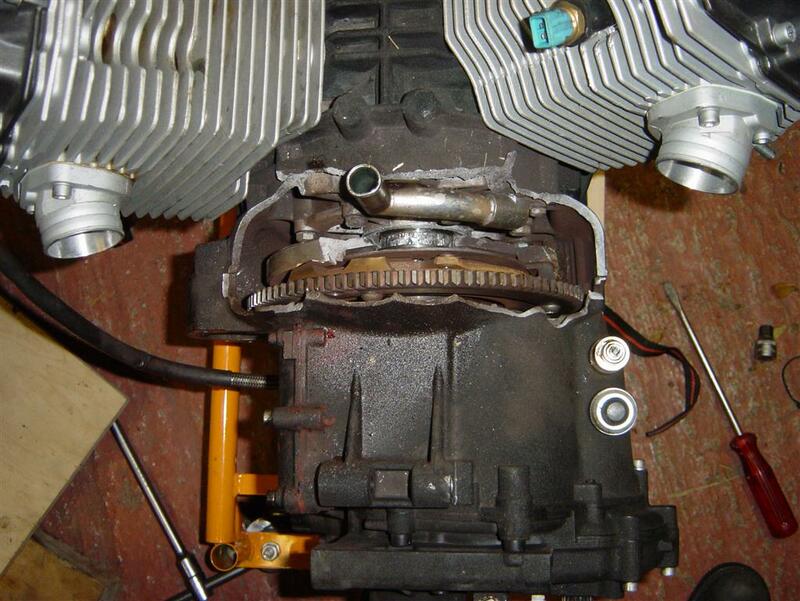 Gearbox and engine were seperated, engine kept its place with front engine mount and the low mounts under the swingarm. It got a new engine and gearbox from factory, under warranty. 7100km old. thats probably the lowest mile fail I'm aware of. Sooo glad mine is outa there. curious.. what flywheel/clutch did they replace it with? I was having different shifting woes, like the clutch wasn't fully disengaging and putting drag on the gear box making it hard to downshift without blipping the throttle. Bled the clutch and changed the springs in the gear box and fresh gear oil didn't make a difference so I assumed a warped bit of clutch somewhere. 2001 Rosso Mandello with 32000kms on it. No sign of cracking or damage on the alloy freewheel. I replaced it with the 5spd RAM clutch (6 speed no longer available when I did it, but essentially the same thing) and it has worked great over 2000kms, all shifting problems are gone. Craig, so the 5 speed was ok for you? No major adjustment needed? Hi Craig, sorry for the double whammy...could you post here the link to the 5 speed RAM you have installed and if you had any adjustment made?